Quick now. Who sang "Happy Trails"? Well it was Roy Rogers and Dale Evans as they rode off into the sunset at the end of their latest celluloid adventure. Rogers died in the late 90s. And just when you thought it was safe to go back on the prairie, along comes an auction of the King of the Cowboys' possessions. Rogers rode a horse in his westerns called Trigger. Turns out, when Trigger's soul went to that great corral in the sky his body remained on earth. Rogers had him stuffed and not put out to pasture but put in a museum. Yep, but now the Roy Rogers and Dale Evans Museum is closed and last weekend Trigger was auctioned off. Make for a great conversation piece in the middle of the living room don't you think? But there's more. No they didn't stuff and auction off Gabby Hayes. But next best thing. You see Rogers had a dog, too, named - wait for it - Bullet. And, you guessed it, He got stuffed - and it wasn't from Kibbles n' Bits. Bullet was auctioned off too, to the same guy that bought Trigger. Hell, makes sense. You've got to have a matching set. Selling price? Trigger went for $266,000. Bullet was a bargain at $35,000. There's still more. Dale Evans had a horse named Buttermilk. Buttermilk's "reamains" sold for $25,000. Now I'm not sure why you'd buy a horse's remains, nor how you'd display them. But whoever bought them, serves them right. That's what you get for floggin' a dead horse! Roy, Trigger and Dale in happier times. 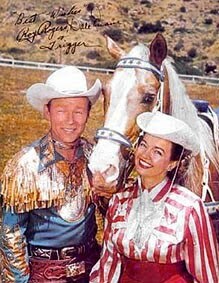 Dale Evans' horse was named "Buttermilk"
Anon: We have an anonymous fan. You're absolutely right. Thanks. I've made the change. What did you call Dale Evan's horse at first, "Butterbuns"? "Skim Milk"? I don't think I could ever stuff a pet. Eeek! A trophy fish, yeah, but not a pet. 00dozo: I called it Buttercup. Buttercup, Buttermilk, meh. The point of the post was Rogers told his horse and dog to get stuffed! My dad was a huge fan of Roy Rogers...and lately, where I volunteer at a senior center (for people of your age group ;), a gentleman brought in his collection of Roy Rogers videocassettes, which we've been watching. Every movie seems to be the same, though. A little song, a little dance...and a little romance, oh, and action too. Yee haw. UR: Hey it's Shieldmaiden96's better half. Watch the "people of your age" thing. I'm not THAT old. In Roy's case, I think the little romance involved Trigger. After all, he doesn't seem to have loved Dale enough to get HER stuffed. Coincidentally, I happen to live in the same city that the museum used to be in, Victorville, CA. How much is the stuffed Dale Evans going for? You didn't say. I answered your question: Joy Rogers! And I guess for the person who purchased the stuffed Trigger, that gives new meaning to the term: trigger happy. 25K for remains of a horse? Wow. That is so, so WRONG! I can't figure out if people have money like this to burn, why won't they give it to me. Yes, the question burns in my soul! Chris: That's the thing, Roy died before he could get Dale stuffed, in a manner of speaking. 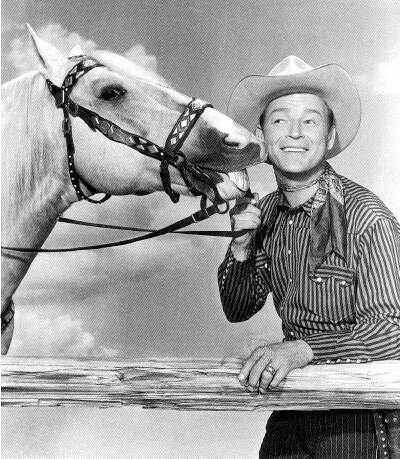 First, I'm going to confess that I'm a huge fan of Roy Rogers' music. I have a bunch of old cowboy songs he sang sitting right next to my Ozzy Osbourne and Led Zeppelin and Tool. Second, I would love to have his horse in my living room. Not enough to spend several hundred thousand dollars on it, but I'd love to have the kind of house that would allow for that sort of weirdness in decor. I'm with Quirky -- rich people, go figure. Go save a Rwandan village, put a kid through college, give me a nice stipend and be my patron of the arts. But 25K for a horse's ash? Ca-razy. PS: that's some set of duds on Roy. And the neckerchief is very masculine as well. Honestly, I don't know which disgusts me more: stuffing a pet or byuing one. Why don't these people get a life? Mike: That's sure an eclectic record collection you have. You may not be able to fit his horse in your living room but how about his dog - right beside your Tool, perhaps? KABLOOEY: I've got a pair of cats I wish would get stuffed. But I'd sure fall right outta my chair if someone paid over @250k for them. Of course Roy's got swell duds; he's a singing cowboy. I think the Mexicans had a phrase for that: gay caballero. RA: I guess they live vicariously through dead animals...stuffed ones at least. I'm sad the museum is closed. My dream of having my own museum now seems further out of reach. But just in case, I'll go on saving my toenail clippings. Like Trigger, they might be worth something one day. My husband, Lurch, and I have decided that when we "pass on", we want to get stuffed (by the taxidermist) in the puppy dog position. The grown kids have to switch off years to display us in their living rooms. We have told them our plans for so many years, they are beginning to believe us and are adding massive supports to their fireplace mantels! I see Dale Evans getting stuffed has been touched on ... but there was a joke, maybe Carson said it, about Roy getting Trigger stuffed and mounted -- Dale too, "but not in that order." I saw an article about this, too. The guy who bought it manages a TV station that shows old cowboy movies and Trigger and Bullet will be in the lobby of the building. I think Roy would like that. kathcom: There was a movie in which a guy collected toe nail or finger nail clippings but damned if I can remember what it was called. If only I could trigger my memory. Malisa: Sure it's not enough you played a big role in their lives when you were alive. Now you're gonna give them nightmares when you're dead. Jayne: Yeah but I'd draw the line when it comes to putting a quarter in them for a 2 minute ride. Canadian Blend: Good one. I love it! And I bet he said, "Giddy-up"! 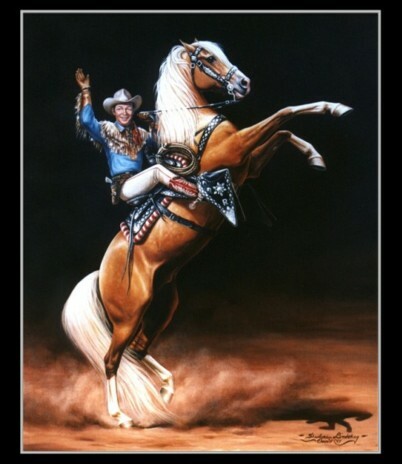 I was a big Roy Rogers during my formative years. (Hey, it was the 50's... there weren't a lot of viewing options available on television.) As I recall, Roy & Dale sang "Happy Trails" as a duet. CL: That's right and Dale wrote the song. I like it so much I'm gonna play it on my blog at the end of every post. "Happy trails to you, until we meet again..." Giddy up.